Dhaka, 23 October, Abnews: The Executive Committee of the National Economic (ECNEC) today approved a project to procure some 35 dredgers involving Taka 4,489.03 crore to keep up navigability in 100 major rivers across the country. 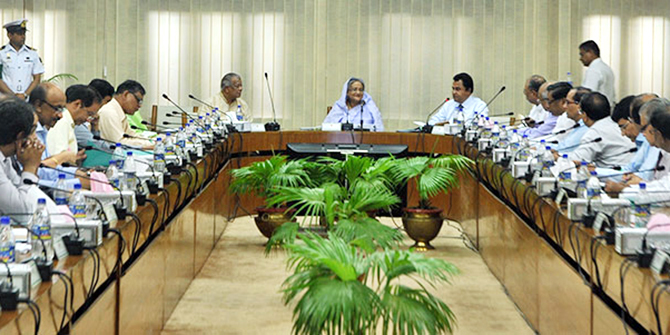 The approval came from the 11th ECNEC meeting of the current fiscal year held at the NEC conference room in the city’s Sher-e-Bangla Nagar area with ECNEC Chairperson and Prime Minister Sheikh Hasina in the chair. Briefing the reporters after the meeting, Planning Minister AHM Mustafa Kamal said a total of 21 projects were approved today involving an overall estimated cost of Taka 19,778.73 crore. “Of the total project cost, Taka 17,316.93 crore will come from the Government of Bangladesh portion, Taka 233.93 crore from the organization’s own fund while the rest of Taka 2,227.87 crore from project assistance,” he said. Of the approved 21 projects, 19 are new while the rest of two are revised projects. The Planning Minister said Bangladesh Inland Water Transport Authority (BIWTA) under the Ministry of Shipping will implement the project by June 2023 while the government would provide the entire project fund from its own resources. The Minister said the dredging would keep ferries, lunches, cargo vessels and other river vessels functional on domestic river routes round the year. dredgers are expected to join its fleet under an ongoing project. With the additional dredgers, the BIWTA will be able to dredge 346.50 lakh cubic meters in 2019. At least 1655.10 lakh cubic meter riverine routes are required to be dredged annually while the overall dredging capacity of the country is 846.50 lakh cubic meters mobilizing dredgers from the BIWTA and the private sector. country’s trade and commerce would get a boost. The project has been framed based on the findings of the ‘Feasibility Study on Capital Dredging and Sustainable River management in Bangladesh’. Once the project is implemented, it will be possible to meet around 70.81 percent of the annual dredging capacity of the country. The main project operations include procurement of two 28″ cutter suction dredgers and other necessary equipment, eight 24″ cutter suction dredgers and other necessary equipment, eight 20″ cutter suction dredgers and other necessary equipment, nine 18″ cutter suction dredgers and other necessary equipment, two 12″ cutter suction dredgers and other necessary equipment, two trailing suctions hoper dredgers along with other necessary equipment, two water injection jetting dredgers, two self propelled pontoon mounted grab dredgers, some 35 cutter suction dredgers crane boats, 30 crew houseboats and five officer house boats. The project area will cover Dhaka, Narayanganj, Manikganj, Munshiganj,Madaripur, Barishal, Bagerhat, Gaibandha, Cox’s Bazar, Chandpur, Kishoreganj, Jamalpur and Sylhet districts. The ECNEC meeting also approved the Land Acquisition and Utility Transfer Project: Support for the Improvement of Dhaka (Kachpur)-Sylhet- Tamabil Highway into four-lane and construction of separate service lanes in both sides with Taka 3,885.72 crore. Under the project, land acquisition on both sides of the 270.557 kilometre highway will be completed side by side there will be transfer of necessary utilities to gradually upgrade this highway into four-lane and thus expand the regional road network. Once the project is implemented, dynamism will be infused to the trade and commerce activities in this region while this initiative will also expedite the extension process of the Asian highway network as well as regional road network including BIMSTEC corridor and SAARC corridor. due standard, height and width with Taka 235.03 crore. The remaining approved projects are Further development of Jahangirnagar University with Taka 1,445.36 crore, Establishing seven regional offices of Bangladesh Public Service Commission Secretariat and its capacity strengthening with Taka 126.90 crore, Land acquisition and other related works for establishing CPGCBL-Sumitomo 1200 MW ultra super critical coal-based power plant with Taka 1,270.09 crore, Construction of roads and other related infrastructures for setting up Paira 1320 MW coal-based power plant with Taka 250.62 crore, Establishment of three handloom service centres in different hand-loom prone areas, 2nd Revised with Taka 88.80 crore, Modernization and infrastructural extension of Bangladesh Handloom Education Training Institute, Narsingdi with Taka 60.15 crore, Greater Mymensingh rural Infrastructure Development, 2nd Revised with Taka 690 crore, River Garai dredging and embankment protection with Taka 591.58 crore, Char Bagadi pump house and Hajimara regulator rehabilitation under Chandpur irrigation project with Taka 117.46 crore, Rangpur Division agriculture and rural development with Taka 321.22 crore and Buffaloes development (2nd phase) with Taka 162.93 crore, Emergency support on water supply and sanitation at Ukhia and Teknaf upazilas in Cox’s Bazar with Taka 585.33 crore and Further development of Cumilla University with Taka 1,655.50 crore.